Antarctica has the strongest winds on the planet. High coastal winds (Katabatic winds, induced by gravity and rushed down from the polar plateau) blow up to 200mph (320km/h). Average 12mph (19km/h). Coldest period is usually end September when the night gives way (compare March in the Arctic). The transmission between the seasons is around 8 weeks to alter complete darkness into perpetual sun. The coldest ever was measured in Vostok July 21,1983 at -128.6F/-89.2C, and the warmest ever was Jan 5, 1974 at the New Zeeland base Vanda with 59F/+15C. The winter wind chill is -150F/-100C. Average wind chill going to the Pole (-28C/19 km/h) is -43F (-46C). There is little precipitation and almost no clouds over the Pole. Precipitation average is less than 2in (50mm) a year. The cold evaporates all humidity and the continent is as dry as the Sahara. Although the sun shines 24/7 in season, the rays hit at an angle and have to pass through more atmosphere than at the equator, thus weakening their energy. To that, the ice of Antarctica immediately reflects most part of the rays back to space. 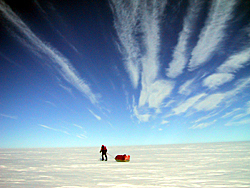 The South Pole season is opposite to the North Pole when it comes to polar travel. You'll arrive in Antarctica's summer and travel into winter. This means that your warmest period will be at the beginning of the trip, gradually cooling off. Expect temperatures to range between -10C to -5C in the beginning, dropping to -15C up to -40C as you are closer to the South Pole. The cold increases further with the climb to altitude. Watch the clouds. Cumulus, a low grey blanket, means no wind, some snowfall and warm temperatures. No shadow but ok contrast. High, sharp streaks of Cirrus bring high winds and sunshine initially, but can also be a precaution of an approaching storm. Alto stratus, a white veil of medium high clouds, are generally trouble. Snowfall for days at end, whiteout and generally bad weather. More unusual is a nasty looking white wall of cloud approaching rapidly with black twisters touching the ice. Expect very high winds within 20 minutes of sight, however the wall usually passes fast - in 30 minutes or so. It looks worse than it is, but secure your gear or camp up. Dry blizzards have no snowfall, just existent snow being picked up and blown around by the high wind. It's very blinding, making it impossible to see objects (like crevasses) 3ft (1m) away. Whiteout is caused by white skies over a snow covered surface and fog like, low white cloud. This causes a loss of depth perception and complete disorientation. On clear days, very clear air allows you to see very far but causes difficulties in judging distance, mountain ranges 60 miles (37km) away are knife sharp, looking much closer than they are. Sundogs are images of several suns in the sky. Sometimes there are also images of pillars and arcs caused by the suns halo. Diamond dust is ice particles floating in clear air, reflecting the sun. Solar wind or "Northern lights": In Antarctica they are “Southern lights” called Aurora Australis as opposite to the Arctic Aurora Borealis. They are electrically charged, high-energy particles from the sun visible on the Poles due to the magnetic lines bending there. Visible only in the dark season as multi-colored giant curtains in the sky. Typically green, white or red. Exceptionally strong in an eleven year cycle (last 2001) of extraordinary solar eruptions. Can interfere with communication technology even through off-season. Antarctica is generally warmer (in skiing season) but windier than the Arctic. The wind chill and the altitude close to the pole will be your major challenge in terms of weather. In addition, Antarctica generally experiences more storms than the North, due to the powerful Katabatic winds, sweeping down from the South Pole plateau.